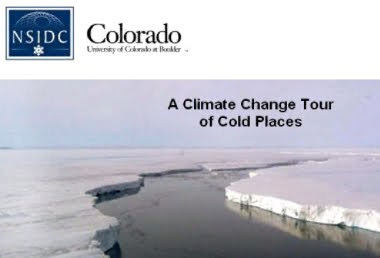 Lisa Ballagh of NSIDC wrote to point out their new 'Climate Change Tour of Cold Places', its a tour in Google Earth. She asked for feedback so I thought I would review it as a post. She also says she found my series of tour tutorials very useful, glad you liked them Lisa! Good Work! : A lot of work has gone into this, overall I think its successful and informative. Good Topic: Climate change of cold places is an excellent topic to tackle in a virtual globe because its very spatial (e.g. permafrost is more common closer to the poles). Also, people don't generally look at the poles on a globe so its good to get flown there to consider them. Convert to YouTube: Given the amount of effort involved, I would definitely convert the tour into a YouTube clip as well. See discussion on this point. Too Long: I think if NSIDC tracked how users access the tour they would find that its too long and that users were stopping part way through. 3 minutes is my guess as a good length of tour in this sort of instance, a solution is to split off the tour into separate parts as was done in the Colombia bridges tour. Other Great NSIDC Content: On the same page as the tour page as the tour but lower down, the "Sea Ice: Daily Concentration and Extent" KMZ project is still one of my favourite GEarth projects. Auto Play YouTube Clips: The use of youtube clips in the tour that automatically play (e.g. 8.47) is inspired. I'll be stealing that code and using that trick myself! Good Start and End: Use of start screens, end screens, advice to turn audio on and which layers to select is well thought out. Good Images: Good images have been selected for use in the tour, especially the retreat of glaciers. YouTube Clips add Human touch: I think the youtube clips themselves add the human touch to the tour, making the content more accessible. (6.33) Fix Photos in Position: At 6.33 an image of Muir glacier slides across the screen showing before and after of glacial retreat. It would be better to fly into the Muir glacier and find the position from where the photo was taken and then overlay the before and after images one by one so they mimic the GEarth view. This gives users a sense of where the glacier is making it more memorable. (7.12) Flight too Fast: Flights from A to B should be looped to include a high altitude view. This helps viewers work out where they've come from and where they're going. They should also be less fast than this one - most users won't follow where they are going at this speed. However, having said that, other flight segments within the tour were timed correctly. (4.41) Split Attention: At this time the audio is describing something about glaciers while the placemark label asks the question, "why is Greenland called Greenland?". Users will be distracted by this, it's best not to split their attention, one way around the problem is to make the placemark only appear on screen when the audio track asks the question. (4.41) Placemark vs Polygon: In discussing Greenland it should be marked as a polygon across the whole country with a camera view showing the whole country rather than the placemark shown at low altitude. A popup will work just as well from a Polygon. (10.13) Timeline Labels and Annotations: To give viewers a sense of the time of events you could add labels for the times of each image. The timeline labels just aren't big enough to follow clearly. You could add annotations to show the physical scale (Rhode island outline over the ice?) and also add a polygon annotation to show the original extent of the ice shelf. The polygon island annotation should persist throughout the animation as the shelf disintegrates. To summarise, this is a good tour with some innovations I'll be copying in the future. Although there are some cons I think they're quite minor points and don't distract from the quality of the work overall.